Phan Y Ly is the founder of SameStuff Theatre - the first independent experimental theatre group in Vietnam. After 4 years working for UNDP and INGO’S in Vietnam, Ly pursued an MA in Theatre and Media for Development in England. Ly’s work facilitates dialogue within and between individuals and groups using a wide range of creative processes and techniques including theatre, film, music, painting. She has initiated projects conducted in the UK, Kenya, Thailand, the Philippines… and in Vietnam, they have been the film-making by children project “My life – my view” (2007), training courses “Craziness”, “Creative movement” (2009). Ly is now the CEO of Life Art, a social enterprise that specializes on using devised theatre techniques for the purpose of individual and social development. Born in 1985, Khiem was trained in Interactive Theatre for 2 years by David Glass Ensemble and has been a talented and intuitive performer in this field for the past 10 years. Khiem has been a practitioner in using arts for social development and uses his theatre and development skills in working with people with HIV/AIDS, those with disabilities and with street children. Gweithiodd gyda nifer o gwmniau theatr Cymreig er 1986, a threuliodd ddegawd hyd y flwyddyn 2000 gyda chwmni Brith Gof. Dechreuodd greu ei gwaith ei hun tua 1990 a gyda’i chydweithwyr mae wedi llunio un ar bymtheg o sioeau sy’n cyfuno dawns, testun, fideo, sain a cherddoriaeth. Since 1986 she has worked with a number of Welsh theatre companies and spent a decade with Brith Gof up until the year 2000. She started making her own work in about 1990 and with her co-workers has since made sixteen shows that combine dance, text, video, sound and music. Born in Wales and established his career in England, Robert Hale is a theatre maker with experience of devising experimental performances in theatres, galleries and other public spaces. He also uses innovative approaches to text and create theatre projects with professional actors and young people in a range of settings and cultures. He has built strong links with groups and organisations in South East Asia. After 15 years experience as a professional actor, Rob studied the directing process with Mike Alfreds, founder of Shared Experience in London. His works have included two training courses on participative theatre in Hanoi and Nghe An (2002), theatre pieces performed in Denmark, at The Old Red Lion Theatre, one of London’s respected Off West End venues. He has also taught and directed at Guildhall School of Music and Drama, Central St Martins University of The Arts and the National Institute of Dramatic Art in Sydney, Australia. Paul trained at Motley following a BA in English at Oxford. Since training he has designed nearly 50 shows for across the UK and at Le Tea (New York), Here (New York), Pakistan National Council of Arts (Islamabad) and WUK (Vienna). In his other roles as a director-designer, with a particular interest in the role design can play at the heart of the theatre-making process, he led devising on A Place at The Table (Camden People’s Theatre), Selfish (Arches, Glasgow, and CPT), Out of Nothing (Junction, Cambridge) and co-led projects in the UK and Siberia for Scale Project. He has also taught design to students in Pakistan, as well as at various UK universities. Paul is on the committee of the Society of British Theatre Designers and has written articles for the society about his international collaborative work. Founded by Phan Y Ly in 2006, SameStuff Theatre is an independent experimental theatre group that aims to explore and experiment with different performing art techniques while using performance as means of social transformation. 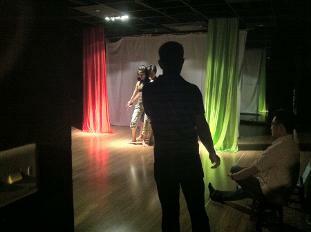 Devising and performing theatrical work is conducted through integration of body movement, puppets, shadow, and masks. Previous productions of SameStuff Theatre include Oe Oe and “NHIN” (performed with artists from Thai Lan). SameStuff Theatre uses artistic skills to bring the “how” to open dialogue, break the culture of silence, encourage reflection, sharing and learning among people.